I received these boots last week. As my child was trying them on, she kept pulling her foot out saying there was something inside. I felt inside and there was an industrial staple with both sharp ends sticking straight up into the footbed. Thank goodness she was being cautious, or she could have been injured. Please feel the inside of any shoes before allowing your child to try them on! 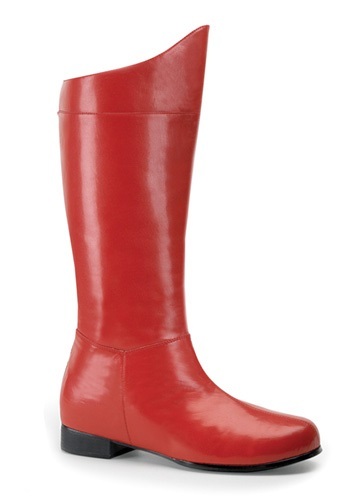 I purchased these after hand making my daughter's Supergirl costume based on the television series. Honestly, I think they were almost perfect for it. I think the color was actually really close and I had no issues with it. The boots come up to the knees. I did check before my daughter put the shoes on and felt no needles/tacks. They were very comfortable for her, as she wore them for three nights of Halloween trick-or-treating. My only complaints are that the boots ARE expensive (even with the discount code) and they scuff pretty easily. The red gives way too easily and you can see the white underneath. I would definitely buy them again because I feel they really complete the costume. Shipping was exactly as scheduled and communication with them was perfect.